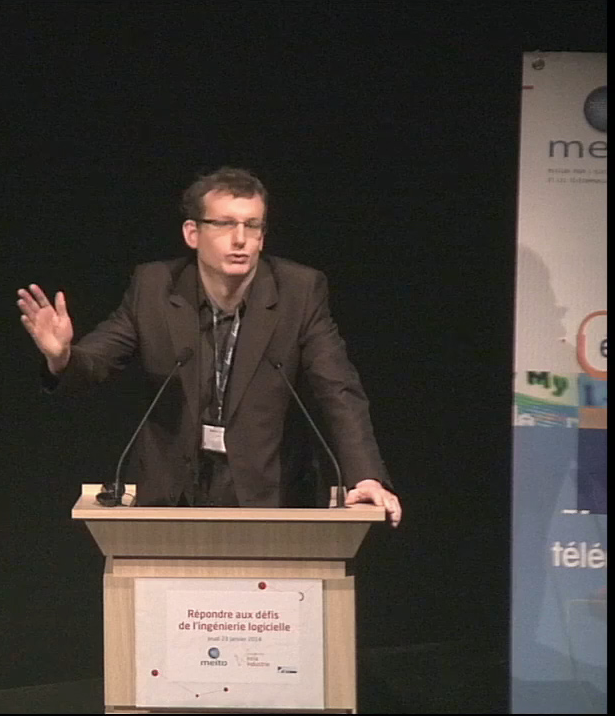 I am Associate Professor at Université of Rennes 1 and a member of the DiverSE team (Inria/IRISA) since september 2012. I am interested in any form of variability (in software, in videos, in 3D printing, in data, etc.). 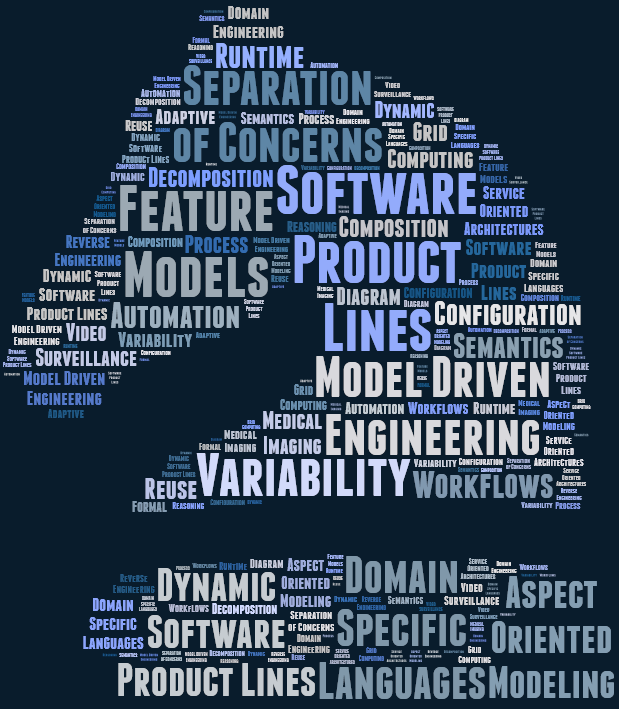 Software product lines, generators, configurations/configurators, product comparison matrix, customizations, feature models, or domain-specific languages are some keywords of my research and teaching. For more details, see below my research interests, software development, publications, or PhD thesis! By the way, I am a chess player (3 international master norms)... If you want to play some blitz, I am always ready! Paul Temple successfully defended his PhD thesis: "Investigate the Matrix: Leveraging Variability to Specialize Software and Test Suites". 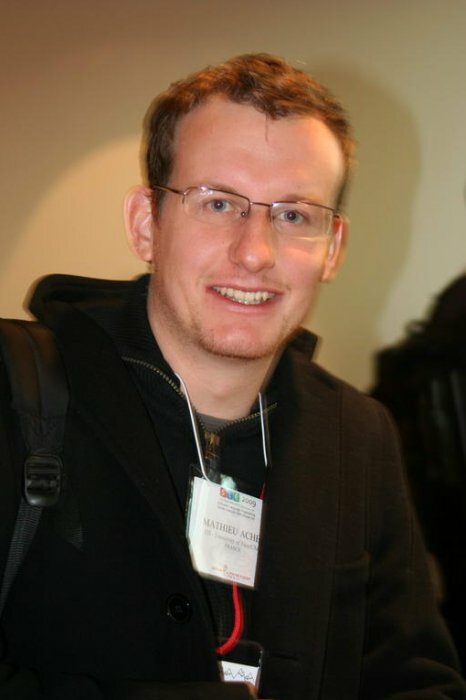 He will be postdoc in Namur, Belgium! In many domains, systems heavily rely on software and have to be efficiently extended, changed, customized or configured for use in a particular context (e.g., to respond to the specific expectations of a customer). The challenge for software practitioners is to develop and use the right models (abstractions), languages, and tool-supported techniques to produce and maintain multiple similar software products (variants), exploiting what they have in common and managing what varies among them. The modeling and management of variability in software intensive systems (often called software product lines) is a complex activity and is the focus of my research. 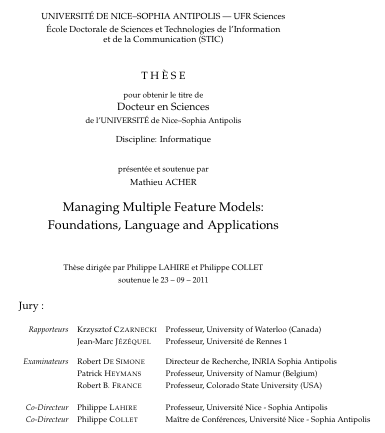 For instance, in my thesis, I developed theoretical foundations and practical support for managing feature models, a widely used formalism for specifying and reasoning about commonality and variability of systems. A resulting output of this research is FAMILIAR, a domain-specific language for managing (several) feature models. Interested in feature models? You should have a look at FAMILIAR (for FeAture Model scrIpt Language for manIpulation and Automatic Reasoning). With FAMILIAR, you can import, export, compose, decompose, edit, refactor, reverse engineer, computing diffs, configure, reverse engineer, or reason about (several) feature models and combine these operations to realize complex variability management tasks. FAMILIAR is developed in Java language using Xtext, a framework for development of DSLs. Off-the-shelf SAT solvers (i.e., SAT4J) and BDD library (i.e., JavaBDD) are internally used to perform FAMILIAR operations. We also provide an Eclipse text editor and an interpreter that executes the various scripts. The interpreter can be used in an interactive mode. We provide multiple notations for specifying feature models (SPLOT, GUIDSL/FeatureIDE, a subset of TVL, etc.) The integration of the language to the FeatureIDE environment has been done to support experimentation. You can try the Eclipse plugin or a standalone version by visiting the webpage of the FAMILIAR project! Configurators rely on logical constraints over parameters to aid users and determine the validity of a configuration. However, for some domains, capturing such configuration knowledge is hard, if not infeasible. This is the case in the 3D printing industry, where parametric 3D object models contain the list of parameters and their value domains, but no explicit constraints. This calls for a complementary approach that learns what configurations are valid based on previous experiences. In this paper, we report on preliminary experiments showing the capability of state-of-the-art classification algorithms to assist the configuration process. While machine learning holds its promises when it comes to evaluation scores, an in-depth analysis reveals the opportunity to combine the classifiers with constraint solvers. This extended abstract summarizes our article entitled " Teaching Software Product Lines: A Snapshot of Current Practices and Challenges " published in the ACM Transactions on Computing Education , vol. 18 in 2017 (http://doi.acm.org/10.1145/3088440). The article reports on three initiatives we have conducted with scholars, educators, industry practitioners, and students to understand the connection between software product lines and education and to derive recommendations for educators to continue improving the state of practice of teaching SPLs. Many approaches for testing configurable software systems start from the same assumption: it is impossible to test all configurations. This motivated the definition of variability-aware abstractions and sampling techniques to cope with large configuration spaces. Yet, there is no theoretical barrier that prevents the exhaustive testing of all configurations by simply enumerating them, if the effort required to do so remains acceptable. Not only this: we believe there is lots to be learned by systematically and exhaustively testing a configurable system. In this case study, we report on the first ever endeavour to test all possible configurations of an industry-strength, open source configurable software system, JHipster, a popular code generator for web applications. We built a testing scaffold for the 26,000+ configurations of JHipster using a cluster of 80 machines during 4 nights for a total of 4,376 hours (182 days) CPU time. We find that 35.70\% configurations fail and we identify the feature interactions that cause the errors. We show that sampling strategies (like dissimilarity and 2-wise): (1) are more effective to find faults than the 12 default configurations used in the JHipster continuous integration; (2) can be too costly and exceed the available testing budget. We cross this quantitative analysis with the qualitative assessment of JHipster's lead developers. How to submit a research paper, a technical report, a grant proposal, or a curriculum vitae that respect imposed constraints such as formatting instructions and page limits? It is a challenging task, especially with time pressure and deadlines. In this paper, we present a solution based on variability, constraint programming, and machine learning techniques for documents written in LaTeX. Users simply have to annotate LaTeX source files with variability information for e.g., (de)activating portions of text, tuning the figures' sizes, or tweaking line spacing. Then, a fully automated procedure learns constraints among Boolean and numerical features for avoiding non-acceptable paper variants. As a result, users can configure their papers (e.g., for controlling the aesthetics) or pick a (random) paper variant that meets constraints e.g., page limits. We describe our implementation and report on some experiences with VaryLaTeX. [Context] In an industrial project, we addressed the challenge of developing a software-based video generator such that consumers and providers of video processing algorithms can benchmark them on a wide range of video variants. [Objective] This article aims to report on our positive experience in modeling, controlling, and implementing software variability in the video domain. [Method] We describe how we have designed and developed a variability modeling language, called VM, resulting from the close collaboration with industrial partners during two years. We expose the specific requirements and advanced variability constructs we developed and used to characterize and derive variations of video sequences. [Results] The results of our experiments and industrial experience show that our solution is effective to model complex variability information and supports the synthesis of hundreds of realistic video variants. [Conclusions] From the software language perspective, we learned that basic variability mechanisms are useful but not enough; attributes and multi-features are of prior importance; meta-information and specific constructs are relevant for scalable and purposeful reasoning over variability models. From the video domain and software perspective, we report on the practical benefits of a variability approach. With more automation and control, practitioners can now envision benchmarking video algorithms over large, diverse, controlled, yet realistic datasets (videos that mimic real recorded videos) – something impossible at the beginning of the project. Estimating and predicting user subjective perceptions on software products is a challenging, yet increasingly important, endeavour. As an extreme case study, we consider the problem of exploring computer-generated art object combinations that will please the maximum number of people. Since it is not feasible to gather feedbacks for all art products because of a combinatorial explosion of possible configurations as well as resource and time limitations, the challenging objective is to rank and identify optimal art product variants that can be generated based on their average likability. We present the use of Software Product Line (SPL) techniques for gathering and leveraging user feedbacks within the boundaries of a variability model. Our approach is developed in two phases: 1) the creation of a data set using a genetic algorithm and real feedback and 2) the application of a data mining technique on this data set to create a ranking enriched with confidence metrics. We perform a case study of a real-world computer-generated art system. The results of our approach on the arts domain reveal interesting directions for the analysis of user-specific qualities of SPLs. Many approaches for testing configurable software systems start from the same assumption: it is impossible to test all configurations. This motivated the definition of variability-aware abstractions and sampling techniques to cope with large configuration spaces. Yet, there is no theoretical barrier that prevents the exhaustive testing of all configurations by simply enumerating them, if the effort required to do so remains acceptable. Not only this: we believe there is lots to be learned by systematically and exhaustively testing a configurable system. In this article, we report on the first ever endeavor to test all possible configurations of an industry-strength, open source configurable software system, JHipster, a popular code generator for web applications. We built a testing scaffold for the 26,000+ configurations of JHipster using a cluster of 80 machines during 4 nights for a total of 4,376 hours (182 days) CPU time. We find that 35.70\% configurations fail and we identify the feature interactions that cause the errors. We show that sampling testing strategies (like dissimilarity and 2-wise) (1) are more effective to find faults than the 12 default configurations used in the JHipster continuous integration; (2) can be too costly and exceed the available testing budget. We cross this quantitative analysis with the qualitative assessment of JHipster's lead developers. Array constraints are essential for handling data structures in automated reasoning and software verification. Unfortunately, the use of a typical finite domain (FD) solver based on local consistency-based filtering has strong limitations when constraints on indexes are combined with constraints on array elements and size. This paper proposes an efficient and complete FD-solving technique for extended constraints over (possibly unbounded) arrays. We describe a simple but particularly powerful transformation for building an equisatisfiable formula that can be efficiently solved using standard FD reasoning over arrays, even in the unbounded case. Experiments show that the proposed solver significantly outperforms FD solvers, and successfully competes with the best SMT-solvers. Modeling how contextual factors relate to a software system’s configuration space is usually a manual, error-prone task that depends highly on expert knowledge. Machine-learning techniques can automatically predict the acceptable software configurations for a given context. Such an approach executes and observes a sample of software configurations within a sample of contexts. It then learns what factors of each context will likely discard or activate some of the software’s features. This lets developers and product managers automatically extract the rules that specialize highly configurable systems for specific contexts. Software Product Line (SPL) engineering has emerged to provide the means to efficiently model, produce, and maintain multiple similar software variants, exploiting their common properties, and managing their variabilities (differences). With over two decades of existence, the community of SPL researchers and practitioners is thriving as can be attested by the extensive research output and the numerous successful industrial projects. Education has a key role to support the next generation of practitioners to build highly complex, variability-intensive systems. Yet, it is unclear how the concepts of variability and SPLs are taught, what are the possible missing gaps and difficulties faced, what are the benefits, or what is the material available. Also, it remains unclear whether scholars teach what is actually needed by industry. In this article we report on three initiatives we have conducted with scholars, educators, industry practitioners, and students to further understand the connection between SPLs and education, i.e., an online survey on teaching SPLs we performed with 35 scholars, another survey on learning SPLs we conducted with 25 students, as well as two workshops held at the International Software Product Line Conference in 2014 and 2015 with both researchers and industry practitioners participating. We build upon the two surveys and the workshops to derive recommendations for educators to continue improving the state of practice of teaching SPLs, aimed at both individual educators as well as the wider community. Though variability is everywhere, there has always been a shortage of publicly available cases for assessing variability-aware tools and techniques as well as supports for teaching variability-related concepts. Historical software product lines contains industrial secrets their owners do not want to disclose to a wide audience. The open source community contributed to large-scale cases such as Eclipse, Linux kernels, or web-based plugin systems (Drupal, WordPress). To assess accuracy of sampling and prediction approaches (bugs, performance), a case where all products can be enumerated is desirable. As configuration issues do not lie within only one place but are scattered across technologies and assets, a case exposing such diversity is an additional asset. To this end, we present in this paper our efforts in building an explicit product line on top of JHipster, an industrial open-source Web-app configurator that is both manageable in terms of configurations (≈ 163,000) and diverse in terms of technologies used. We present our efforts in building a variability-aware chain on top of JHipster's configurator and lessons learned using it as a teaching case at the University of Rennes. We also sketch the diversity of analyses that can be performed with our infrastructure as well as early issues found using it. Our long term goal is both to support students and researchers studying variability analysis and JHipster developers in the maintenance and evolution of their tools. A large scale configurable system typically offers thousands of options or parameters to let the engineers customize it for specific needs. Among the resulting many billions possible configurations, relating option and parameter values to desired performance is then a daunting task relying on a deep know how of the internals of the configurable system. In this paper, we propose a staged configuration process to narrow the space of possible configurations to a good approximation of those satisfying the wanted high level customer requirements. Based on an oracle (e.g. a runtime test) that tells us whether a given configuration meets the requirements (e.g. speed or memory footprint), we leverage machine learning to retrofit the acquired knowledge into a variability model of the system that can be used to automatically specialize the configurable system. We validate our approach on a set of well-known configurable software systems. Our results show that, for many different kinds of objectives and performance qualities, the approach has interesting accuracy, precision and recall after a learning stage based on a relative small number of random samples. Domain analysts, product managers, or customers aim to capture the important features and differences among a set of related products. A case-by-case reviewing of each product description is a laborious and time-consuming task that fails to deliver a condense view of a family of product. In this article, we investigate the use of automated techniques for synthesizing a product comparison matrix (PCM) from a set of product descriptions written in natural language. We describe a tool-supported process, based on term recognition, information extraction, clustering, and similarities, capable of identifying and organizing features and values in a PCM – despite the informality and absence of structure in the textual descriptions of products. We evaluate our proposal against numerous categories of products mined from BestBuy. Our empirical results show that the synthesized PCMs exhibit numerous quantitative, comparable information that can potentially complement or even refine technical descriptions of products. The user study shows that our automatic approach is capable of extracting a significant portion of correct features and correct values. This approach has been implemented in MatrixMiner a web environment with an interactive support for automatically synthesizing PCMs from informal product descriptions. MatrixMiner also maintains traceability with the original descriptions and the technical specifications for further refinement or maintenance by users. Unbundling is a phenomenon that consists of dividing an existing software artifact into smaller ones. It can happen for different reasons , one of them is the fact that applications tend to grow in func-tionalities and sometimes this can negatively influence the user experience. For example, mobile applications from well-known companies are being divided into simpler and more focused new ones. Despite its current importance, little is known or studied about unbundling or about how it relates to existing software engineering approaches, such as modularization. Consequently, recent cases point out that it has been performed unsystematically and arbitrarily. In this article, our main goal is to present this novel and relevant concept and its underlying challenges in the light of software engineering, also exemplifying it with recent cases. We relate un-bundling to standard software modularization, presenting the new motivations behind it, the resulting problems, and drawing perspectives for future support in the area. By analogy with software product reuse, the ability to reuse (meta)models and model transformations is key to achieve better quality and productivity. To this end, various op-portunistic reuse techniques have been developed, such as higher-order transformations, metamodel adaptation, and model types. However, in contrast to software product development that has moved to systematic reuse by adopting (model-driven) software product lines, we are not quite there yet for modelling languages, missing economies of scope and automation opportunities. Our vision is to transpose the product line paradigm at the metamodel level, where reusable assets are formed by metamodel and transformation fragments and " products " are reusable language building blocks (model types). We introduce featured model types to concisely model variability amongst metamodelling elements, enabling configuration, automated analysis, and derivation of tailored model types. In systems engineering, practitioners shall explore numerous architectural alternatives until choosing the most adequate variant. The decision-making process is most of the time a manual, time-consuming, and error-prone activity. The exploration and justification of architectural solutions is ad-hoc and mainly consists in a series of tries and errors on the mod-eling assets. In this paper, we report on an industrial case study in which we apply variability modeling techniques to automate the assessment and comparison of several candidate architectures (variants). We first describe how we can use a model-based approach such as the Common Variability Language (CVL) to specify the architectural variability. We show that the selection of an architectural variant is a multi-criteria decision problem in which there are numerous interactions (veto, favor, complementary) between criteria. We present a tooled process for exploring architectural variants integrating both CVL and the MYRIAD method for assessing and comparing variants based on an explicit preference model coming from the elicitation of stakeholders' concerns. This solution allows understanding differences among variants and their satisfactions with respect to criteria. Beyond variant selection automation improvement, this experiment results highlight that the approach improves rationality in the assessment and provides decision arguments when selecting the preferred variants. Online configurators are basically everywhere. From physical goods (cars, clothes) to services (cloud solutions, insurances, etc.) such configurators have pervaded many areas of everyday life, in order to provide the customers products tailored to their needs. Being sometimes the only interfaces between product suppliers and consumers, much care has been devoted to the HCI aspects of configurators, aiming at offering an enjoyable buying experience. However, at the backend, the management of numerous and complex configuration options results from ad-hoc process rather than a systematic variability-aware engineering approach. We present our experience in analysing web configurators and formalising configuration options in terms of feature models or product configuration matrices. We also consider behavioural issues and perspectives on their architectural design. Variability intensive systems may include several thousand features allowing for an enormous number of possible configurations , including wrong ones (e.g. the derived product does not compile). For years, engineers have been using constraints to a priori restrict the space of possible configurations , i.e. to exclude configurations that would violate these constraints. The challenge is to find the set of constraints that would be both precise (allow all correct configurations) and complete (never allow a wrong configuration with respect to some oracle). In this paper, we propose the use of a machine learning approach to infer such product-line constraints from an oracle that is able to assess whether a given product is correct. We propose to randomly generate products from the product line, keeping for each of them its resolution model. Then we classify these products according to the oracle, and use their resolution models to infer cross-tree constraints over the product-line. We validate our approach on a product-line video generator, using a simple computer vision algorithm as an oracle. We show that an interesting set of cross-tree constraint can be generated, with reasonable precision and recall. The strength of chess engines together with the availability of numerous chess games have attracted the attention of chess players, data scientists, and researchers during the last decades. State-of-the-art engines now provide an authoritative judgement that can be used in many applications like cheating detection, intrinsic ratings computation, skill assessment, or the study of human decision-making. A key issue for the research community is to gather a large dataset of chess games together with the judgement of chess engines. 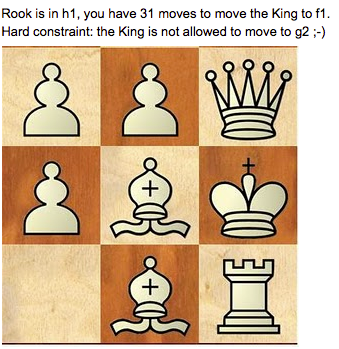 Unfortunately the analysis of each move takes lots of times. In this paper, we report our effort to analyse almost 5 millions chess games with a computing grid. During summer 2015, we processed 270 millions unique played positions using the Stockfish engine with a quite high depth (20). We populated a database of 1+ tera-octets of chess evaluations, representing an estimated time of 50 years of computation on a single machine. Our effort is a first step towards the replication of research results, the supply of open data and procedures for exploring new directions, and the investigation of software engineering/scalability issues when computing billions of moves. Adapting real-time embedded software for various variants of an application and usage contexts is highly demanded. However, the question of how to analyze real-time properties for a family of products (rather than for a single one) has not drawn much attention from researchers. In this paper , we present a formal analysis framework to analyze a family of platform products w.r.t. real-time properties. To this end, we rst propose an extension of the widely-used feature model, called Property Feature Model (PFM), that distinguishes features and properties explicitly, so that the scope of properties restricted to features can be explicitly dened. Then we present formal behavioral models of components of a real-time scheduling unit, i.e. tasks, resources, and resource schedulers, such that all real-time scheduling units implied by a PFM are automatically composed with the components to be analyzed against the properties given by the PFM. We apply our approach to the verication of the schedulability of a family of scheduling units using the symbolic and statistical model checkers of Uppaal. Companies increasingly rely on product differentiation and personalization strategies to provide their customers with an expansive catalog, and tools to assist them in finding the product meeting their needs. These tools include product search facilities, recommender systems, and product configurators. They typically represent a product as a set of features, which refer to a large number of technical specifications (e.g. size, weight, battery life). However, customers usually communicate and reason about products in terms of their qualities (e.g. ease-of-use, portability, ergonomics). In this paper, we tackle the problem of formalizing product qualities in the requirements of product-centred applications. Our goal is to extract product qualities from their technical features, so that customers can better perceive and evaluate the proposed products. To this end, we design a procedure for identifying segments of textual product documentation related to specific product qualities, and propose an approach based on fuzzy modeling to represent product qualities on top of technical specifications. Preliminary experiments we carried out on a catalog of cameras tend to show that fuzzy modeling is an appropriate formalism for representing product qualities. We also illustrate how modeled qualities can support the design of product configurators that are centered on the customers' needs. Domain analysts, product managers, or customers aim to capture the important features and differences among a set of related products. A case-by-case reviewing of each product description is a laborious and time-consuming task that fails to deliver a condensed view of a product line. This paper introduces MatrixMiner: a tool for automatically synthesizing product comparison matrices (PCMs) from a set of product descriptions written in natural language. MatrixMiner is capable of identifying and organizing features and values in a PCM – despite the informality and absence of structure in the textual descriptions of products. Our empirical results of products mined from BestBuy show that the synthesized PCMs exhibit numerous quantitative, comparable information. Users can exploit MatrixMiner to visualize the matrix through a Web editor and review, refine, or complement the cell values thanks to the traceability with the original product descriptions and technical specifications. What do you give for free to your competitor when you exhibit a product line? This paper addresses this question through several cases in which the discovery of trade secrets of a product line is possible and can lead to severe consequences. That is, we show that an outsider can understand the variability realization and gain either confidential business information or even some economical direct advantage. For instance, an attacker can identify hidden constraints and bypass the product line to get access to features or copyrighted data. This paper warns against possible naive modeling, implementation, and testing of variability leading to the existence of product lines that jeopardize their trade secrets. Our vision is that defensive methods and techniques should be developed to protect specifically variability – or at least further complicate the task of reverse engineering it. Feature models have become one of the most widely used formalism for representing the variability among the products of a product line. The design of a feature model from a set of existing products can help stakeholders communicate on the commonalities and differences between the products, facilitate the adoption of mass customization strategies, or provide foundations for engineering product configurators. As the manual construction of feature models proves to be a time-consuming and error prone task, researchers have proposed various approaches for automatically deriving feature models from available product data. Existing techniques mostly rely on data mining algorithms that search for frequently occurring patterns between the features included in product configurations. However, when the number of features is too large, the sparsity among the configurations can reduce the quality of the extracted model. In this paper, we discuss motivations for the development of dimensionality reduction techniques for product lines in order to support the extraction of feature models in the case of high-dimensional product spaces. We use a real world dataset to illustrate the problems arising with high dimensionality and present four research questions to address these problems. Many real-world product lines are only represented as non-hierarchical collections of distinct products, described by their configuration values. As the manual preparation of feature models is a tedious and labour-intensive activity, some techniques have been proposed to automatically generate boolean feature models from product descriptions. However, none of these techniques is capable of synthesizing feature attributes and relations among attributes, despite the huge relevance of attributes for documenting software product lines. In this paper, we introduce for the first time an algorithmic and parametrizable approach for computing a legal and appropriate hierarchy of features, including feature groups, typed feature attributes, domain values and relations among these attributes. We have performed an empirical evaluation by using both randomized configuration matrices and real-world examples. The initial results of our evaluation show that our approach can scale up to matrices containing 2,000 attributed features, and 200,000 distinct configurations in a couple of minutes. In systems engineering, the deployment of software components is error-prone since numerous safety and security rules have to be preserved. Another related problem is that numerous variants of deployments on different platforms are possible. In this paper we present a technological solution to assist industrial practitioners in producing a safe and secure solution out of numerous architectural variants. First, we introduce a pattern technology that provides correct-by-construction deployment models through the reuse of modeling artefacts organized in a catalog. Second, we develop a variability solution, connected to the pattern technology and based on an extension of the common variability language, for supporting the synthesis of model-based architectural variants. This paper describes a live demonstration of an industrial effort seeking to bridge the gap between variability modeling and system engineering practices. We illustrate the tooling support with an industrial case study (a secure radio platform). Unbundling is a phenomenon that consists of dividing an existing software artifact into smaller ones. For example, mobile applications from well-known companies are being divided into simpler and more focused new ones. Despite its current importance, little is known or studied about unbundling or about how it relates to existing software engineering approaches, such as modularization. Consequently, recent cases points out that it has been performed unsystematically and arbitrarily. In this paper, our main goal is to present this novel and relevant concept and its challenges in the light of software engineering, exemplifying it with recent cases. We relate unbundling to standard software modularization, presenting the new motivations behind it, the resulting problems, and drawing perspectives for future support in the area. Feature modeling is a widely used formalism to characterize a set of products (also called configurations). As a manual elaboration is a long and arduous task, numerous techniques have been proposed to reverse engineer feature models from various kinds of artefacts. But none of them synthesize feature attributes (or constraints over attributes) despite the practical relevance of attributes for documenting the different values across a range of products. In this report, we develop an algorithm for synthesizing attributed feature models given a set of product descriptions. We present sound, complete, and parametrizable techniques for computing all possible hierarchies, feature groups, placements of feature attributes, domain values, and constraints. We perform a complexity analysis w.r.t. number of features, attributes, configurations, and domain size. We also evaluate the scalability of our synthesis procedure using randomized configuration matrices. This report is a first step that aims to describe the foundations for synthesizing attributed feature models. We relate an original experience concerning a popular online video service that offers to generate variants of an humorous video. To further the understanding of the generator, we have reverse engineered its general behavior, architecture, as well as its variation points and its configuration space. The reverse engineering also allows us to create a new generator and online configurator that proposes 18 variation points – instead of only 3 as in the original generator. We explain why and how we have collaborated and are collaborating with the original creators of the video generator. We also highlight how our reverse engineering work represents a threat to the original service and call for further investigating variability-aware security mechanisms. 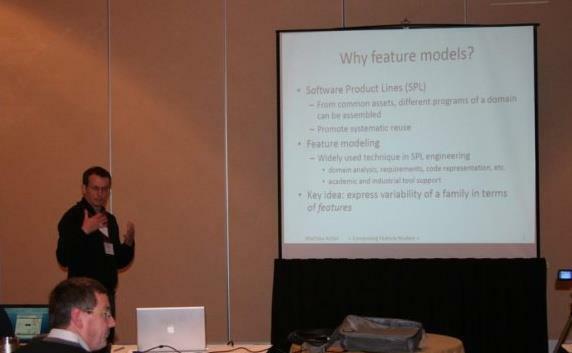 Feature Models (FMs) are a popular formalism for modeling and reasoning about the configurations of a software product line. As the manual construction of an FM is time-consuming and error-prone, management operations have been developed for reverse engineering, merging, slicing, or refactoring FMs from a set of configurations/dependencies. Yet the synthesis of meaningless ontological relations in the FM – as defined by its feature hierarchy and feature groups – may arise and cause severe difficulties when reading, maintaining or exploiting it. Numerous synthesis techniques and tools have been proposed, but only a few consider both configuration and ontolog-ical semantics of an FM. There are also few empirical studies investigating ontological aspects when synthesizing FMs. In this article, we define a generic, ontologic-aware synthesis procedure that computes the likely siblings or parent candidates for a given feature. We develop six heuristics for clustering and weighting the logical, syntactical and semantical relationships between feature names. We then perform an empirical evaluation on hundreds of FMs, coming from the SPLOT repository and Wikipedia. We provide evidence that a fully automated synthesis (i.e., without any user intervention) is likely to produce FMs far from the ground truths. As the role of the user is crucial, we empirically analyze the strengths and weak-nesses of heuristics for computing ranking lists and different kinds of clusters. We show that a hybrid approach mixing logical and ontological techniques outperforms state-of-the-art solutions. We believe our approach, environment, and empirical results support researchers and practitioners working on reverse engineering and management of FMs. External or internal domain-specific languages (DSLs) or (fluent) APIs? Whoever you are -- a developer or a user of a DSL -- you usually have to choose side; you should not! What about metamorphic DSLs that change their shape according to your needs? Our 4-years journey of providing the "right" support (in the domain of feature modeling), led us to develop an external DSL, different shapes of an internal API, and maintain all these languages. A key insight is that there is no one-size-fits-all solution or no clear superiority of a solution compared to another. On the contrary, we found that it does make sense to continue the maintenance of an external and internal DSL. Based on our experience and on an analysis of the DSL engineering field, the vision that we foresee for the future of software languages is their ability to be self-adaptable to the most appropriate shape (including the corresponding integrated development environment) according to a particular usage or task. We call metamorphic DSL such a language, able to change from one shape to another shape. Attack trees are widely used in the fields of defense for the analysis of risks (or threats) against electronics systems, computer control systems or physical systems. Based on the analysis of attack trees, practitioners can define actions to engage in order to reduce or annihilate risks. A major barrier to support computer-aided risk analysis is that attack trees can become largely complex and thus hard to specify. This paper is a first step towards a methodology, formal foundations as well as automated techniques to synthesize attack trees from a high-level description of a system. Attacks are expressed as a succession of elementary actions and high-level actions can be used to abstract and organize attacks into exploitable attack trees. We describe our tooling support and identify open challenges for supporting the analysis of risks. This paper reports about a new domain-specific variability modeling language, called VM, resulting from the close collaboration with industrial partners in the video domain. We expose the requirements and advanced variability constructs required to characterize and realize variations of physical properties of a video (such as objects' speed or scene illumination). The results of our experiments and industrial experience show that VM is effective to model complex variability information and can be exploited to synthesize video variants. We concluded that basic variability mechanisms are useful but not enough, attributes and multi-features are of prior importance, and meta-information is relevant for efficient variability analysis. In addition, we questioned the existence of one-size-fits-all variability modeling solution applicable in any industry. Yet, some common needs for modeling variability are becoming apparent such as support for attributes and multi-features. Product Comparison Matrices (PCMs) form a rich source of data for comparing a set of related and competing products over numerous features. Despite their apparent simplicity, PCMs contain heterogeneous, ambiguous, uncontrolled and partial information that hinders their efficient exploitations. In this paper, we formalize PCMs through model-based automated techniques and develop additional tooling to support the edition and re-engineering of PCMs. 20 participants used our editor to evaluate the PCM metamodel and automated transformations. The results over 75 PCMs from Wikipedia show that (1) a significant proportion of the formalization of PCMs can be automated - 93.11\% of the 30061 cells are correctly formalized; (2) the rest of the formalization can be realized by using the editor and mapping cells to existing concepts of the metamodel. The automated approach opens avenues for engaging a community in the mining, re-engineering, edition, and exploitation of PCMs that now abound on the Internet. In a Model-based Software Product Line (MSPL), the variability of the domain is characterized in a variability model and the core artifacts are base models conforming to a modeling language (also called metamodel). A realization model connects the features of the variability model to the base model elements, triggering operations over these elements based on a configuration. The design space of an MSPL is extremely complex to manage for the engineer, since the number of variants may be exponential and the derived product models have to be conforming to numerous well-formedness and business rules. In this paper, the objective is to provide a way to generate MSPLs, called counterexamples (also called anti-patterns), that can produce invalid product models despite a valid configuration in the variability model. We describe the foundations and motivate the usefulness of counterexamples (e.g., inference of guidelines or domain-specific rules to avoid earlier the specification of incorrect mappings; testing oracles for increasing the robustness of derivation engines given a modeling language). We provide a generic process, based on the Common Variability Language (CVL) to randomly search the space of MSPLs for a specific modelling language. We develop LineGen a tool on top of CVL and modeling technologies to support the methodology and the process. LineGen targets different scenarios and is flexible to work either with just a domain metamodel as input or also with pre-defined variability models and base models. We validate the effectiveness of this process for three formalisms at different scales (up to 247 metaclasses and 684 rules). We also apply the approach in the context of a real industrial scenario involving a large-scale metamodel. 3D printing is gaining more and more momentum to build customized product in a wide variety of fields. We conduct an exploratory study of Thingiverse, the most popular Website for sharing user-created 3D design files, in order to establish a possible connection with software product line (SPL) engineering. We report on the socio-technical aspects and current practices for modeling variability, implementing variability, configuring and deriving products, and reusing artefacts. We provide hints that SPL-alike techniques are practically used in 3D printing and thus relevant. Finally, we discuss why the customization in the 3D printing field represents a challenging playground for SPL engineering. Diversity emerges as a critical concern that spans all activities in software engineering (from design to verification, from deployment to runtime resilience) and appears in all sorts of domains, which rely on software intensive systems, from systems of systems to pervasive combinations of Internet of Things and Internet of Services. If these domains are apparently radically different, we envision a strong convergence of the scientific principles underpinning their construction and validation towards flexible and open yet dependable systems. In this paper, we discuss the software engineering challenges raised by these requirements for flexibility and openness, focusing on four dimensions of diversity: the diversity of functionalities required by the different customers; the diversity of languages used by the stakeholders involved in the construction of these systems; the diversity of runtime environments in which software has to run and adapt; the diversity of failures against which the system must be able to react. In particular, we want to emphasize the challenges for handling imposed diversity, as well as the opportunities to leverage chosen diversity. The main challenge is that software diversity imposes to integrate the fact that software must adapt to changes in the requirements and environment -- in all development phases and in unpredictable ways. Yet, exploiting and increasing software diversity is a great opportunity to allow the spontaneous exploration of alternative software solutions and proactively prepare for unforeseen changes. Concretely, we want to provide software engineers with the ability: to characterize an 'envelope' of possible variations; to compose 'envelopes' (to discover new macro envelopes in an opportunistic manner); to dynamically synthesize software inside a given envelop. Recently, domain-specific language development has become again a topic of interest, as a means to help designing solutions to domain-specific problems. Componentized language frameworks, coupled with variability modeling, have the potential to bring language development to the masses, by simplifying the configuration of a new language from an existing set of reusable components. However, designing variability models for this purpose requires not only a good understanding of these frameworks and the way components interact, but also an adequate familiarity with the problem domain. In this paper we propose an approach to automatically infer a relevant variability model from a collection of already implemented language components, given a structured, but general representation of the domain. We describe techniques to assist users in achieving a better understanding of the relationships between language components, and find out which languages can be derived from them with respect to the given domain. Testing techniques in industry are not yet adapted for product line engineering (PLE). In particular, Model-based Testing (MBT), a technique that allows to automatically generate test cases from requirements, lacks support for managing variability (differences) among a set of related product. In this paper, we present an approach to equip usage models, a widely used formalism in MBT, with variability capabilities. Formal correspondences are established between a variability model, a set of functional requirements, and a usage model. An algorithm then exploits the traceability links to automatically derive a usage model variant from a desired set of selected features. The approach is integrated into the professional MBT tool MaTeLo and is currently used in industry. This paper discusses the merits and challenges of adopting software product line engineering (SPLE) as the main development process for an automotive Hall Effect sensor. This versatile component is integrated into a number of automotive applications with varying safety requirements (e.g., windshield wipers and brake pedals). This paper provides a detailed explanation as to why the process of safety assessment and verification of the Hall Effect sensor is currently cumbersome and repetitive:\~it must be repeated entirely for every automotive application in which the sensor is to be used. In addition, no support is given to the engineer to select and configure the appropriate safety solutions and to explain the safety implications of his decisions. To address these problems, we present a tailored SPLE-based approach that combines model-driven development with advanced model composition techniques for applying and reasoning about specific safety solutions. In addition, we provide insights about how this approach can reduce the overall complexity, improve reusability, and facilitate safety assessment of the Hall Effect sensor. Nuclear power plants are some of the most sophisticated and complex energy systems ever designed. These systems perform safety critical functions and must conform to national safety institutions and international regulations. In many cases, regulatory documents provide very high level and ambiguous requirements that leave a large margin for interpretation. As the French nuclear industry is now seeking to spread its activities outside France, it is but necessary to master the ins and the outs of the variability between countries safety culture and regulations. This sets both an industrial and a scientific challenge to introduce and propose a product line engineering approach to an unaware industry whose safety culture is made of interpretations, specificities, and exceptions. This paper presents our current work within the French R\&D project CONNEXION, while introducing variability modeling to the French nuclear industry. In particular, we discuss the background, the quest for the best variability paradigm, the practical modeling of requirements variability as well as the mapping between variable requirements and variable architecture elements. We present ViViD, a variability-based tool to synthesize variants of video sequences. ViViD is developed and used in the context of an industrial project involving consumers and providers of video processing algorithms. The goal is to synthesize synthetic video variants with a wide range of characteristics to then test the algorithms. We describe the key components of ViViD(1) a variability language and an environment to model what can vary within a video sequence; (2) a reasoning back-end to generate relevant testing configurations; (3) a video synthesizer in charge of producing variants of video sequences corresponding to configurations. We show how ViViD can synthesize realistic videos with different characteristics such as luminances, vehicles and persons that cover a diversity of testing scenarios. Education has a key role to play for disseminating the constantly growing body of Software Product Line (SPL) knowledge. Teaching SPLs is challenging and it is unclear how SPLs can be taught, what are the possible benefits, or what is the material available. This workshop aims to explore and explain the current status and ongoing work on teaching SPLs at universities, colleges, and in industry (e.g., by consultants). Participants will discuss gaps and difficulties faced when teaching SPLs, benefits to research and industry, different ways to teach SPL knowledge, common threads, interests, and problems. The overall goal is to strengthen the important aspect of teaching in the SPL community. The strong cost pressure of the market and safety issues faced by aerospace industry affect the development. Suppliers are forced to continuously optimize their life-cycle processes to facilitate the development of variants for different customers and shorten time to market. Additionally, industrial safety standards like RTCA/DO-178C require high efforts for testing single products. A suitably organized test process for Product Lines (PL) can meet standards. In this paper, we propose an approach that adopts Model-based Testing (MBT) for PL. Usage models, a widely used MBT formalism that provides automatic test case generation capabilities, are equipped with variability information such that usage model variants can be derived for a given set of features. The approach is integrated in the professional MBT tool MaTeLo. We report on our experience gained from an industrial case study in the aerospace domain. During the construction of software product lines, variability management is a crucial activity. A large number of software variants must be produced, in most cases, by using extensible architectures. In this chapter, we present the various applications of a set of modular management variability tools (FAMILIAR) for different forms of architecture (component-, service- and plug-in-based), and at different stages of the software life cycle. We discuss the lessons learnt from these studies and present guidelines for resolving recurring problems linked to multiple variability and to software architecture. A key problem when developing video processing software is the difficulty to test different input combinations. In this paper, we present VANE, a variability-based testing approach to derive video sequence variants. The ideas of the approach are i) to encode what can vary within a video sequence in a variability model; ii) exploit the variability model to generate a certain number of testable configurations; iii) synthesize variants of video sequences corresponding to configurations. VANE computes T-wise covering sets while maximizing a function over quality attributes. Also, we present a preliminary validation of the VANE approach in the context of an industrial project involving the test of video processing algorithms. Product comparators and configurators aim to assist customers in choosing a product that meets their expectations. While comparators present similarities and differences between competing products, configurators propose an assisted environment to gradually choose and customize products. The two systems have pros and cons and are inherently different. But both share the same variability information background and operate over a set of (possible) products, typically represented through product comparison matrices (PCMs). A key issue is that current PCMs have no clear semantics, making their analysis and transformations imprecise and hard. In this paper, we sketch a research plan for generating dedicated comparators or configurators from PCMs. The core of our vision is the use of formal variability models to encode PCMs and enables a further exploitation by developers of comparators or configurators. We elaborate on five research questions and describe the expected outputs of the research. Class diagrams are among the most popular modeling languages in industrial use. In a model-driven development process, class diagrams evolve, so it is important to be able to assess differences between revisions, as well as to propagate differences using suitable merge operations. Existing differencing and merging methods are mainly syntactic, concentrating on edit operations applied to model elements, or they are based on sampling: enumerating some examples of instances which characterize the difference between two diagrams. This paper presents the first known (to the best of our knowledge) automatic model merging and differencing operators supported by a formal semantic theory guaranteeing that they are semantically sound. All instances of the merge of a model and its difference with another model are automatically instances of the second model. The differences we synthesize are represented using class diagram notation (not edits, or instances), which allows creation of a simple yet flexible algebra for diffing and merging. It also allows presenting changes comprehensively, in a notation already known to users. Feature Models (FMs) are a popular formalism for modeling and reasoning about the configurations of a software product line. As the manual construction or management of an FM is time-consuming and error-prone for large software projects, recent works have focused on automated operations for reverse engineering or refactoring FMs from a set of configurations/dependencies. Without prior knowledge, meaningless ontological relations (as defined by the feature hierarchy and groups) are likely to be synthesized and cause severe difficulties when reading, maintaining or exploiting the resulting FM. In this paper we define a generic, ontological-aware synthesis procedure that guides users when identifying the likely siblings or parent candidates for a given feature. We develop and evaluate a series of heuristics for clustering/weighting the logical, syntactic and semantic relationships between features. 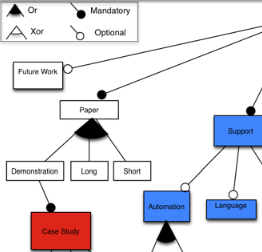 Empirical experiments on hundreds of FMs, coming from the SPLOT repository and Wikipedia, show that an hybrid approach mixing logical and ontological techniques outperforms state-of-the-art solutions and offers the best support for reducing the number of features a user has to consider during the interactive selection of a hierarchy. Lors de la construction de lignes de produits logiciels, la gestion de la variabilité est une activité cruciale. Un très grand nombre de variantes logicielles doit être réalisé, le plus souvent en utilisant des architectures extensibles. Dans ce chapitre, nous présentons plusieurs applications d'un outillage (FAMILIAR) de gestion modulaire de la variabilité à différentes formes d'architectures (à base de composants, de services, de plugins) et à différents stades du cycle de vie logiciel. Nous discutons les leçons apprises de ces études, ainsi que quelques problèmes ouverts liés à la variabilité et aux architectures logicielles. A Web configurator offers a highly interactive environment to assist users in customising sales products through the selection of configuration options. Our previous empirical study revealed that a significant number of configurators are suboptimal in reliability, efficiency, and maintainability, opening avenues for re-engineering support and methodologies. This paper presents a tool-supported reverse-engineering process to semi-automatically extract configuration-specific data from a legacy Web configurator. The extracted and structured data is stored in formal models (e.g., variability models) and can be used in a forward-engineering process to generate a customized interface with an underlying reliable reasoning engine. Two major components are presented: (1) a Web Wrapper that extracts structured configuration-specific data from unstructured or semi-structured Web pages of a configurator, and (2) a Web Crawler that explores the configuration space (i.e., all objects representing configuration-specific data) and simulates users' configuration actions. We describe variability data extraction patterns, used on top of the Wrapper and the Crawler to extract configuration data. Experimental results on five existing Web configurators show that the specification of a few variability patterns enable the identification of hundreds of options. With around two decades of existence, the community of Software Product Line (SPL) researchers and practitioners is thriving as can be attested by the extensive research output and the numerous successful industrial projects. Education has a key role to support the next generation of engineers to build highly complex SPLs. Yet, it is unclear how SPLs are taught, what are the possible missing gaps and difficulties faced, what are the benefits, or what is the material available. In this paper, we carry out a survey with over 30 respondents with the purpose of capturing a snapshot of the state of teaching in our community. We report and discuss quantitative as well as qualitative results of the survey. We build upon them and sketch six concrete actions to continue improving the state of practice of SPL teaching. Product comparison matrices (PCMs) provide a convenient way to document the discriminant features of a family of related products and now abound on the internet. Despite their apparent simplicity, the information present in existing PCMs can be very heterogeneous, partial, ambiguous, hard to exploit by users who desire to choose an appropriate product. Variability Models (VMs) can be employed to formulate in a more precise way the semantics of PCMs and enable automated reasoning such as assisted configuration. Yet, the gap between PCMs and VMs should be precisely understood and automated techniques should support the transition between the two. In this paper, we propose variability patterns that describe PCMs content and conduct an empirical analysis of 300+ PCMs mined from Wikipedia. Our findings are a first step toward better engineering techniques for maintaining and configuring PCMs. Modeling and managing variability is a key activity in a growing number of software engineering contexts. Support for composing variability models is arising in many engineering scenarios, for instance, when several subsystems or modeling artifacts, each coming with their own variability and possibly developed by different stakeholders, should be combined together. In this paper, we consider the problem of composing feature models (FMs), a widely used formalism for representing and reasoning about a set of variability choices. We show that several composition operators can actually be defined, depending on both matching/merging strategies and semantic properties expected in the composed FM. We present four alternative forms and their implementations. We discuss their relative trade-offs w.r.t. reasoning, customizability, traceability, composability and quality of the resulting feature diagram. We summarize these findings in a reading grid which is validated by revisiting some relevant existing works. 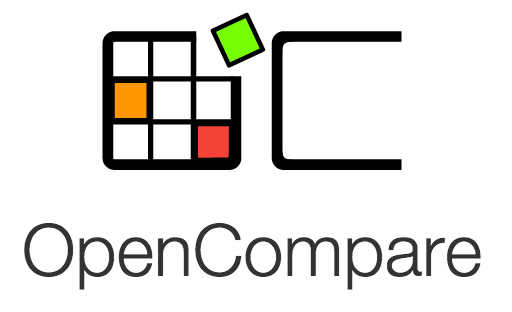 Our contribution should assist developers in choosing and implementing the right composition operators. Variability modelling and management is pervasive in a growing number of software engineering contexts (e.g., software product lines, dynamic adaptive systems). Feature models are the de facto standard to formally represent and reason about commonality and variability of a software system. This tutorial aims at presenting feature modelling languages and tools, directly applicable to a wide range of model-based variability problems and application domains. We will explain how to import, export, compose, decompose, edit, configure, compute diffs, refactor, reverse engineer, test, or reason about (multiple) feature models. We will also illustrate how these "smart" operations can be combined to realize complex variability management tasks. Participants (being practitioners or academics, beginners or advanced) will learn the principles and foundations of tool-supported techniques dedicated to the model-based management of variability. Feature Models (FMs) are used extensively in software product line engineering to help generate and validate individual product configurations and to provide support for domain analysis. As FM construction can be tedious and time-consuming, researchers have previously developed techniques for extracting FMs from sets of formally specified individual configurations, or from software requirements specifications for families of existing products. However, such artifacts are often not available. In this paper we present a novel, automated approach for constructing FMs from publicly available product descriptions found in online product repositories and marketing websites such as SoftPedia and CNET. While each individual product description provides only a partial view of features in the domain, a large set of descriptions can provide fairly comprehensive coverage. Our approach utilizes hundreds of partial product descriptions to construct an FM and is described and evaluated against antivirus product descriptions mined from SoftPedia. Model-based Software Product Line (MSPL) engineering aims at deriving customized models corresponding to individual products of a family. MSPL approaches usually promote the joint use of a variability model, a base model expressed in a specific formalism, and a realization layer that maps variation points to model elements. The design space of an MSPL is extremely complex to manage for the engineer, since the number of variants may be exponential and the derived product models have to be conformant to numerous well-formedness and business rules. In this paper, the objective is to provide a way to generate MSPLs, called counterexamples, that can produce invalid product models despite a valid configuration in the variability model. We provide a systematic and automated process, based on the Common Variability Language (CVL), to randomly search the space of MSPLs for a specific formalism. We validate the effectiveness of this process for three formalisms at different scales (up to 247 metaclasses and 684 rules). We also explore and discuss how counterexamples could guide practitioners when customizing derivation engines, when implementing checking rules that prevent early incorrect CVL models, or simply when specifying an MSPL. The customization of almost everything is observed in a wide range of domains. Many organizations should address the challenge of extending, changing, customizing or conﬁguring numerous kinds of systems and artefacts (requirements, components, services, languages, architectural or design models, codes, user interfaces, etc.) for use in a particular context. As a result, modeling and managing variability of such systems and artefacts is a crucial activity in a growing number of software engineering contexts (e.g., software product lines, dynamic adaptive architectures). Numerous model-based techniques have been proposed and usually consist in i) a variability model (e.g., a feature model), ii) a model (e.g., a class diagram) expressed in a domain-speciﬁc modeling language (e.g., Uniﬁed Modelling language), and iii) a realization layer that maps and transforms variation points into model elements. Based on a selection of desired features in the variability model, a derivation engine can automatically synthesise customized models – each model corresponding to an individual product. In this tutorial, we present the foundations and tool-supported techniques of state-of-the-art variability modeling technologies. In the first part, we briefly exemplify the management of variability in some systems/artefacts (design models, languages, product conﬁgurators). We introduce the Common Variability Language (CVL), a representative approach and ongoing effort involving both academic and industry partners to promote standardization variability modeling technology. In the second part, we focus on feature models the most popular notation to formally represent and reason about commonality and variability of a software system. Feature modelling languages and tools, directly applicable to a wide range of model-based variability problems and application domains, are presented. The FAMILIAR language and environment is used to perform numerous management operations like the import, export, compose, decompose, edit, conﬁgure, compute diffs, refactor, reverse engineer, test, or reason about (multiple) feature models. We describe their theoretical foundations, efficient implementations, and how these operations can be combined to realize complex variability management tasks. In the third part, we show how to combine feature models and other modeling artefacts. We revisit the examples given in the first part of the tutorial, using the Kermeta workbench and familiarCVL, an implementation of CVL. Finally we present some of the ongoing challenges for variability modeling. At the end of the tutorial, participants (being practitioners or academics, beginners or advanced) will learn languages, tools and novel variability modeling techniques they can directly use in their industrial contexts or as part of their research. Variability management is a key issue when building and evolving software-intensive systems, making it possible to extend, configure, customize and adapt such systems to customers' needs and specific deployment contexts. A wide form of variability can be found in extensible software systems, typically built on top of plugin-based architectures that offer a (large) number of configuration options through plugins. In an ideal world, a software architect should be able to generate a system variant on-demand, corresponding to a particular assembly of plugins. To this end, the variation points and constraints between architectural elements should be properly modeled and maintained over time (i.e., for each version of an architecture). A crucial, yet error-prone and time-consuming, task for a software architect is to build an accurate representation of the variability of an architecture, in order to prevent unsafe architectural variants and reach the highest possible level of flexibility. In this article, we propose a reverse engineering process for producing a variability model (i.e., a feature model) of a plugin-based architecture. We develop automated techniques to extract and combine different variability descriptions, including a hierarchical software architecture model, a plugin dependency model and the software architect knowledge. By computing and reasoning about differences between versions of architectural feature models, software architect can control both the variability extraction and evolution processes. The proposed approach has been applied to a representative, large-scale plugin-based system (FraSCAti), considering different versions of its architecture. We report on our experience in this context. Nowadays, mass customization has been embraced by a large portion of the industry. As a result, the web abounds with sales config- urators that help customers tailor all kinds of goods and services to their specific needs. In many cases, configurators have become the sin- gle entry point for placing customer orders. As such, they are strategic components of companies' information systems and must meet stringent reliability, usability and evolvability requirements. However, the state of the art lacks guidelines and tools for efficiently engineering web sales configurators. To tackle this problem, empirical data on current practice is required. The first part of this paper reports on a systematic study of 111 web sales configurators along three essential dimensions: rendering of configuration options, constraint handling, and configuration process support. Based on this, the second part highlights good and bad prac- tices in engineering web sales configurator. The reported quantitative and qualitative results open avenues for the elaboration of methodolo- gies to (re-)engineer web sales configurators. Feature Models (FMs) are a popular formalism for modelling and reasoning about commonality and variability of a system. In essence, FMs aim to define a set of valid combinations of features, also called configurations. In this paper, we tackle the problem of synthesising an FM from a set of configurations. The main challenge is that numerous candidate FMs can be extracted from the same input configurations, yet only a few of them are meaningful and maintainable. We first characterise the different meanings of FMs and identify the key properties allowing to discriminate between them. We then develop a generic synthesis procedure capable of restituting the intended meanings of FMs based on inferred or user-specified knowledge. Using tool support, we show how the integration of knowledge into FM synthesis can be realized in different practical application scenarios that involve reverse engineering and maintaining FMs. The feature model formalism has become the de facto standard for managing variability in software product lines (SPLs). In practice, developing an SPL can involve modeling a large number of features representing di erent viewpoints, sub-systems or concerns of the software system. This activity is generally tedious and error-prone. In this article, we present FAMILIAR a Domain-Specific Language (DSL) that is dedicated to the large scale management of feature models and that complements existing tool support. The language provides a powerful support for separating concerns in feature modeling, through the provision of composition and decomposition operators, reasoning facilities and scripting capabilities with modularization mechanisms. We illustrate how an SPL consisting of medical imaging services can be practically managed using reusable FAMILIAR scripts that implement reasoning mechanisms. We also report on various usages and applications of FAMILIAR and its operators, to demonstrate their applicability to di erent domains and use for di erent purposes. Feature models (FMs) are a popular formalism to describe the commonality and variability of a set of assets in a software product line (SPL). SPLs usually involve large and complex FMs that describe thousands of features whose legal combinations are governed by many and often complex rules. The size and complexity of these models is partly explained by the large number of concerns considered by SPL practitioners when managing and configuring FMs. In this chapter, we first survey concerns and their separation in FMs, highlighting the need for more modular and scalable techniques. We then revisit the concept of view as a simplified representation of an FM. We finally describe a set of techniques to specify, visualize and verify the coverage of a set of views. These techniques are implemented in complementary tools providing practical support for feature-based configuration and large scale management of FMs. Feature models are a widespread means to represent commonality and variability in software product lines. As is the case for other kinds of models, computing and managing feature model differences is useful in various real-world situations. In this paper, we propose a set of novel differencing techniques that combine syntactic and semantic mechanisms, and automatically produce meaningful differences. Practitioners can exploit our results in various ways: to understand, manipulate, visualize and reason about differences. They can also combine them with existing feature model composition and decomposition operators. The proposed automations rely on satisfiability algorithms. They come with a dedicated language and a comprehensive environment. We illustrate and evaluate the practical usage of our techniques through a case study dealing with a configurable component framework. Feature models (FMs) are a popular formalism for describing the commonality and variability of software product lines (SPLs) in terms of features. SPL development increasingly involves manipulating many large FMs, and thus scalable modular techniques that support compositional development of complex SPLs are required. In this paper, we describe how a set of complementary operators (aggregate, merge, slice) provides practical support for separation of concerns in feature modeling. We show how the combination of these operators can assist in tedious and error prone tasks such as automated correction of FM anomalies, update and extraction of FM views, reconciliation of FMs and reasoning about properties of FMs. For each task, we report on practical applications in different domains. We also present a technique that can efficiently decompose FMs with thousands of features and report our experimental results. The development of scientiﬁc workﬂows is evolving towards the systematic use of service oriented architectures, enabling the composition of dedicated and highly parameterized software services into processing pipelines. Building consistent workﬂows then becomes a cumbersome and error-prone activity as users cannot manage such large scale variability. This paper presents a rigorous and tooled approach in which techniques from Software Product Line (SPL) engineering are reused and extended to manage variability in service and workﬂow descriptions. Composition can be facilitated while ensuring consistency. Services are organized in a rich catalog which is organized as a SPL and structured according to the common and variable concerns captured for all services. By relying on sound merging techniques on the feature models that make up the catalog, reasoning about the compatibility between connected services is made possible. Moreover, an entire workﬂow is then seen as a multiple SPL (i.e., a composition of several SPLs). When services are conﬁgured within, the propagation of variability choices is then automated with appropriate techniques and the user is assisted in obtaining a consistent workﬂow. The approach proposed is completely supported by a combination of dedicated tools and languages. Illustrations and experimental validations are provided using medical imaging pipelines, which are representative of current scientiﬁc workﬂows in many domains. Variability modelling and management is a key activity in a growing number of software engineering contexts, from software product lines to dynamic adaptive systems. Feature models are the defacto standard to formally represent and reason about commonality and variability of a software system. This tutorial aims at presenting next generation of feature modelling languages and tools, directly applicable to a wide range of model-based variability problems and application domains. Participants (being practitioners or academics, beginners or advanced) will learn the principles and foundations of languages and tool-supported techniques dedicated to the model-based management of variability. In product line engineering, domain analysis is the process of analyzing related products to identify their common and variable features. This process is generally carried out by experts on the basis of existing product descriptions, which are expressed in a more or less structured way. Modeling and reasoning about product descriptions are error-prone and time consuming tasks. Feature models (FMs) consti- tute popular means to specify product commonalities and variabilities in a compact way, and to provide automated support to the domain analysis process. This paper aims at easing the transition from product descriptions expressed in a tabular format to FMs accurately representing them. This process is parameterized through a dedicated language and high-level directives (e.g., products/features scoping). We guarantee that the resulting FM represents the set of legal feature combinations supported by the considered products and has a readable tree hierarchy together with variability information. We report on our experiments based on public data and characterize the properties of the derived FMs. A factor slowing down the use of feature models is that either the concepts or the relations expressed in a feature model are not defined at all, or defined in an unsatisfactory manner; feature models are sometimes too vague to be analyzed by a reasoning tool. It is thus difficult to determine if the features in a feature model are arranged and structured consistently with domain knowledge and if they are accurately expressed, organized and represented. Ontology modeling can improve feature modeling by providing additional information relevant for the domain in which a feature model is constructed. Finding synergies between feature models and ontologies will aid an SPL engineer in accurately expressing, organizing and representing features in their feature models. In this paper, we look at potential benefits in using the two modeling formalisms together, we identify issues and challenges considering the gap between the two formalisms and discuss the importance of this gap. We report on our current ideas and results. You can download the manuscript in pdf, have a look at the list of publications, or simply read the abstract below. Feature models (FMs) are a fundamental formalism for specifying and reasoning about commonality and variability of software product lines (SPLs). FMs are becoming increasingly complex, handled by several stakeholders or organizations, used to describe features at various levels of abstraction and related in a variety of ways. In different contexts and application domains, maintaining a single large FM is neither feasible nor desirable. Instead, multiple FMs are now used. In this thesis, we develop theoretical foundations and practical support for managing multiple FMs. We design and develop a set of composition and decomposition operators (aggregate, merge, slice) for supporting separation of concerns. The operators are formally defined, implemented with a fully automated algorithm and guarantee properties in terms of sets of configurations. We show how the composition and decomposition operators can be combined together or with other reasoning and editing operators to realize complex tasks. We propose a textual language, FAMILIAR (for FeAture Model scrIpt Language for manIpulation and Automatic Reasoning), which provides a practical solution for managing FMs on a large scale. An SPL practitioner can combine the different operators and manipulate a restricted set of concepts (FMs, features, configurations, etc.) using a concise notation and language facilities. FAMILIAR hides implementation details (e.g., solvers) and comes with a development environment. We report various applications of the operators and usages of FAMILIAR in different domains (medical imaging, video surveillance) and for different purposes (scientific workflow design, variability modeling from requirements to runtime, reverse engineering), showing the applicability of both the operators and the supporting language. Without the new capabilities brought by the operators and FAMILIAR, some analysis and reasoning operations would not be made possible in the different case studies. I am playing chess since I am 8 years old. I discovered this fantastic game (sport?) by happenstance in my born city. I quickly moved to Cannes chess club at 11 years old, gaining the opportunity to be trained by famous international grand masters. I have a sort of "record" and I am proud of it! At the moment, I am not playing chess at a high level (no time? ), but I am always ready to play a blitz online (e.g., on internet chess club or playchess). You can consult some of my games online. I suggest the following three games: a win against Santo Roman in first french chess league (France, 2000), a win against Zhigalko in World youth chess championship (Greece, 2002) and a draw against Vachier-Lagrave in first french chess league (France, 2007). I am also very interested by developing software for chess. I have a lot of ideas, I hope to have time to do that in the future or simply supervise software projects related to chess! News: publication of Large-scale Analysis of Chess Games with Chess Engines: A Preliminary Report as part of an internship during summer 2015 with François Esnault. We have analyzed almost 5 millions chess games with a computing grid, have processed 270 millions unique played positions using the Stockfish engine with a quite high depth (20). Now we have a database of 1+ tera-octets of chess evaluations and we are exploring different directions (rating, depth, blunders, etc.). Do not hesitate to contact me if you are interested to talk about it!